If you follow me on Twitter, Instagram or Snapchat you will know that on Tuesday evening I attended the #VeryDresses event. I was lucky enough to be invited to this first of its kind event from the Very team in Liverpool. This was a brilliant opportunity for us northern bloggers since a lot of these type of events are always in London, I thought it was great that Very decided to plan this event at their northern offices. If you don't already know who or what Very is then read on... Very.co.uk launched in 2009 with a big idea to make shopping style a little less scary and they like to say "Whatever you do, do it in style" Which to me is a perfect motto as it should be easy enough for us to shop for stylish clothing, shoes, accessories and even home wear and we shall all do it in style! Very makes shopping online fun, easy and accessible with different payment plans available. Very sells everything from dresses to shoes to laptops so it's really easy to find what your looking for, all on just one website. As for fashion Very has it's own brand labels including 'V by Very', as well as high street brands and designer available to buy online; they work with celebrity brands too. Still want to know more? Head to the Very website and see for yourself. Tuesday evening for me started with a train and bus ride into Liverpool and to the Very offices; I was welcomed by a lady at reception and given a pass to wear at the event. I felt very important with a lanyard around my neck which had my name and blogger on it. All of us was taken to another part of the building to the event space where the evening would start. 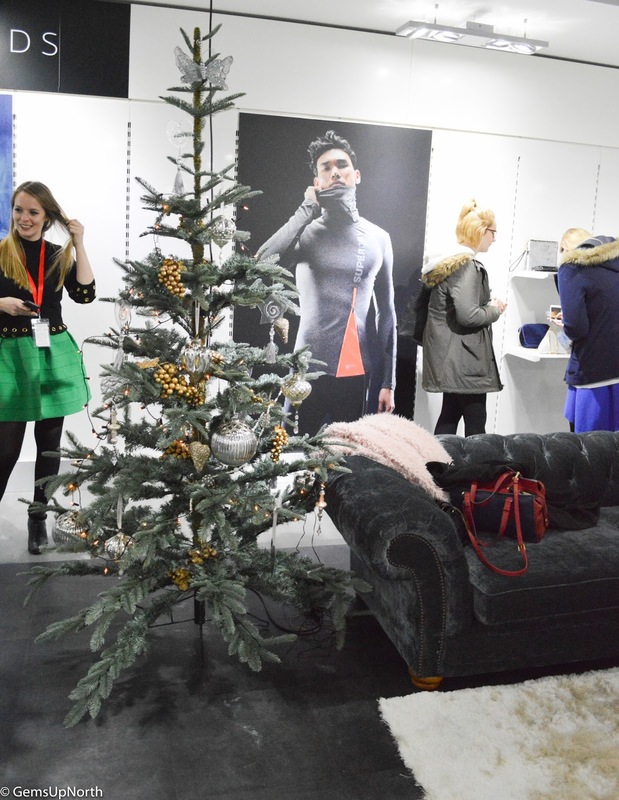 I was overwhelmed at how good the event space looked, it was like walking into a designer shop with dressed windows, garments hung on the walls, mannequins styled in glamorous outfits and accessories, there was even a Christmas tree and a wonderful selfie backdrop which was supplied by the lovely Prop Me Pretty for the evening. The event was put together by Alex and Renee who can I add did an amazing job! Alex told me the event was the first from the Very offices and hopes that there will be more events in the future if this one is successful; which I hope it was, for me I had a fantastic time! 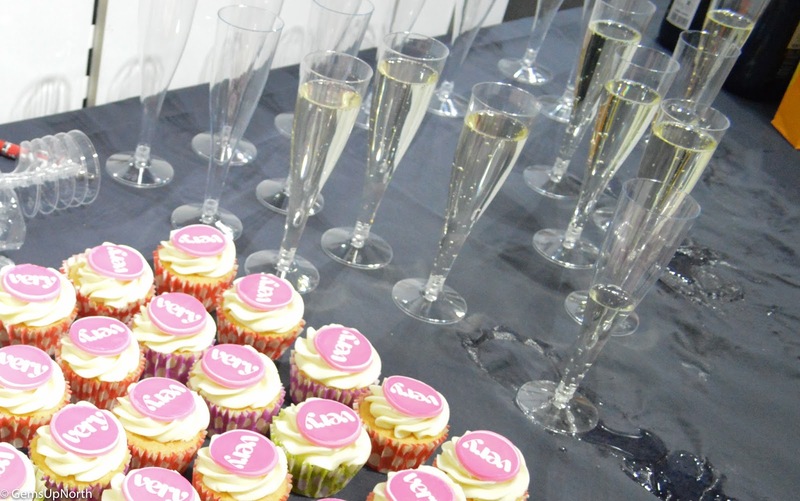 All the bloggers and guests was welcomed with a glass of prosecco or orange juice and a Very cupcake then we was let loose to look at all the glitz and glam around the room. Walking into the event I spotted the windows first, having some visual merchandising background, windows are something I particularly look at especially when I am shopping. They are important for bringing in customers and trade and grabbing peoples attention. Very had dressed the windows with hanging shoes and bags with a dress in each window too; the hanging items was spaced out well and it was easy to see each item. In the middle of the room was 5 mannequins dressed like they was ready to party in the festivities, most of which was sporting the sequin trend that is popular this season. 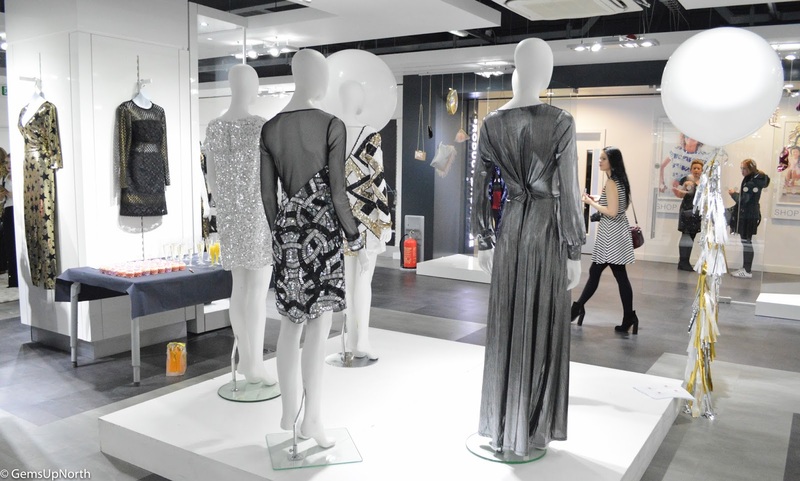 Around the room was collections of garments from Very's own brand, high street, celebrity and designer. I instantly picked up on how the garments was placed together, they was grouped in colours which as a shopper made it a lot easier for me to see. 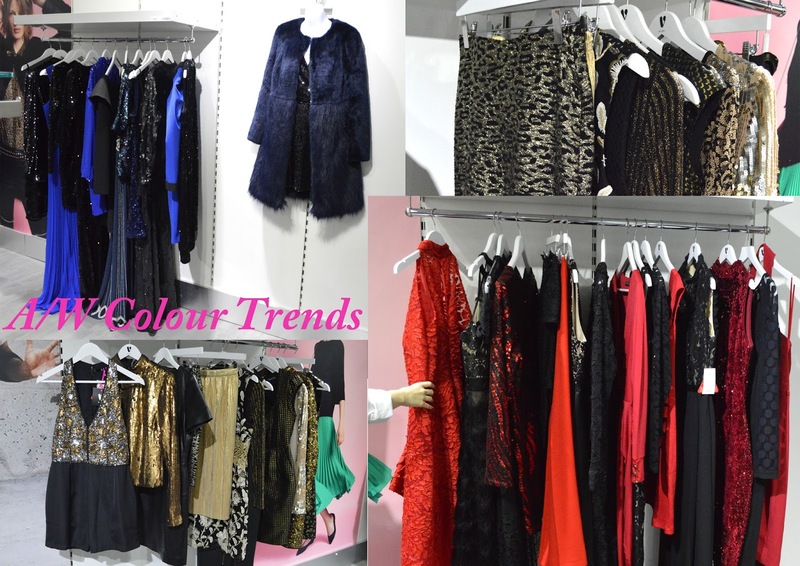 This seasons colours are golds, reds, blues and nudes with lots of sequins, sparkle and embellishments; these probably are the perfect trends for the Christmas months. The whole room felt very festive especially with the dressed Christmas tree at one end of the room. 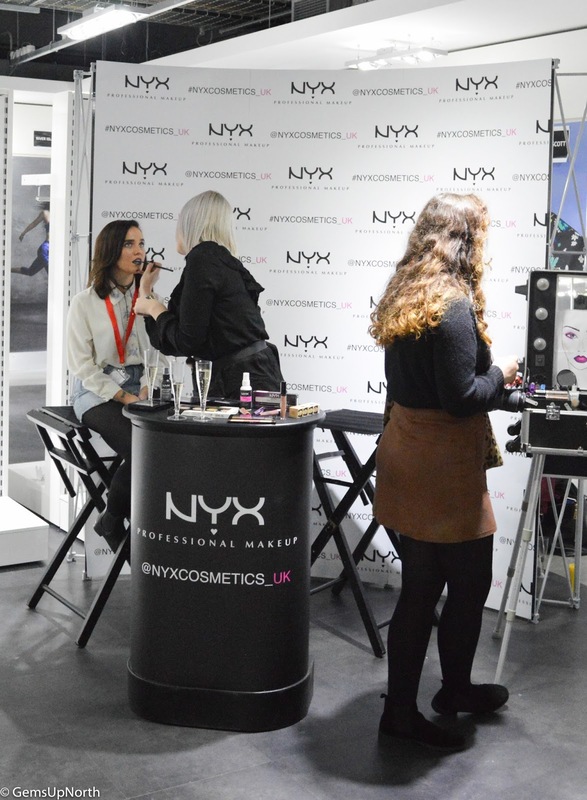 To add to the sparkle of the evening NYX cosmetics was there to show us their glitter makeup ranges, bloggers could have their eyes or lips glittered. Some of the looks coming from the counter was excellent, one girl had a blue glitter lip and another a red; the MUA's was also applying glitter eyeliner to some bloggers. 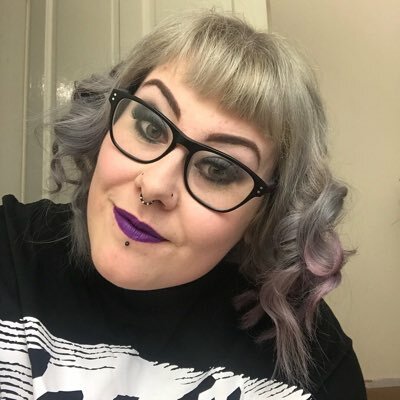 I'm really happy to know that NYX is stocked on Very.co.uk too! 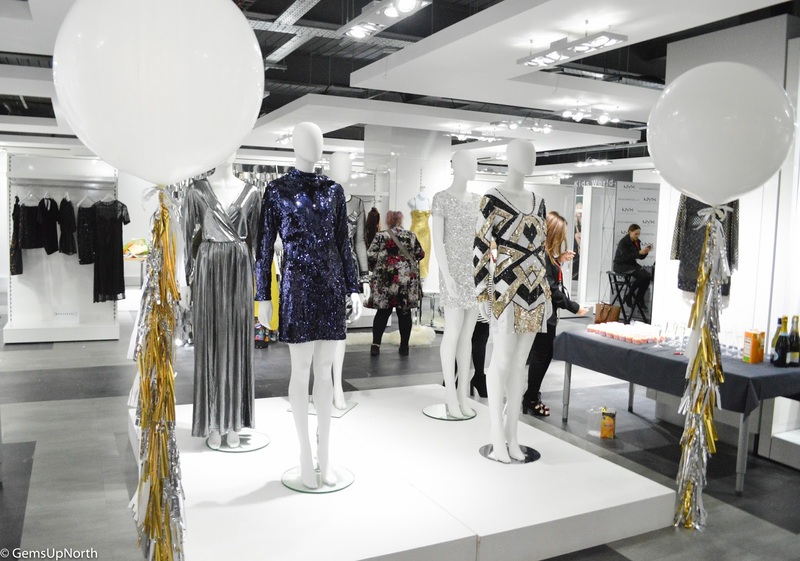 Very had put together this event to showcase the party seasons dresses available on their website; lots of dresses was on display as well as some tops, trousers, and jackets which really gave me the feeling that there was something for everyone. In September at the Curve Fashion Festival, I found out that Very have a curve (plus size) range so I was glad to see a couple of pieces in bigger sizes also showcased on the evening. You can't have a dress without shoes so Very had plenty of shoes on display a lot of them being from designer brand Kurt Geiger, I loved all the glitter heals! My favourite dress of the evening was from celebrity Rochelle Humes, this dress caught my eye more than once with it's full front and back embellishments giving the dress an alternative feel which is right up my street. I love the style of the dress, with the collar also being embellished and having a body con fit. This would be my ultimate party dress for this season with some plain black heals and bag and maybe a glitter lip too. Earlier I mentioned how the garments was placed in colour groups making it easier to put together outfits in my mind. It was good to see the different fabrics in the same colour groups, this shows that there are lots of different styles around with your favourite fabrics. 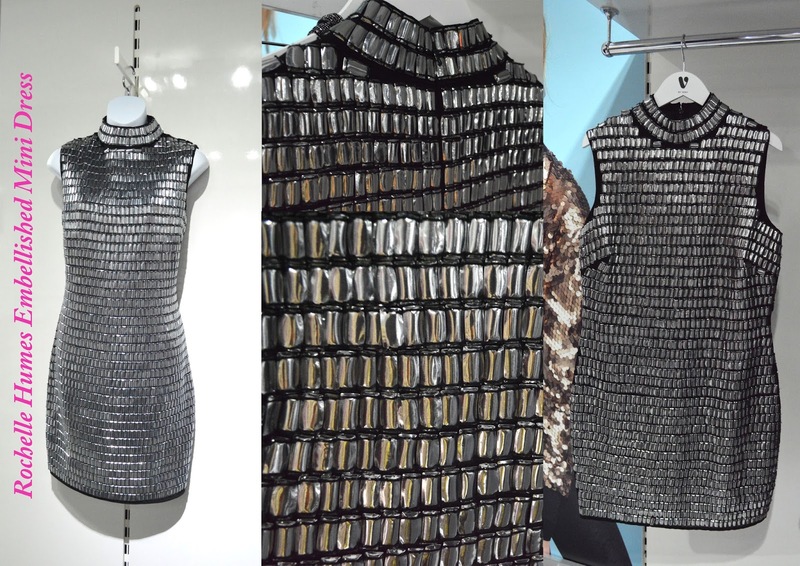 Some fabrics that are popular this season are; heavily embellished (sequin, glitter, chains, beads), lace, pleated and velvet. The event featured lots and lots of dresses, some hung up within the colour groups, some hung on the walls and some displayed in glass cases but all the dresses was showcased well for us all to see. As well as the Rochelle Humes dress above I fell in love with this gold mermaid style dress however I don't feel the fit would suit me but I've told my friend she should totally buy it. The selection of shoes on display had just as many glitter vibes as the clothing, with heals, boots and platforms available for us to see, there was glitter material, embellished boots and sliver metallic colours. I'm sure everyone can find a pair of shoes to go with that festive party dress! 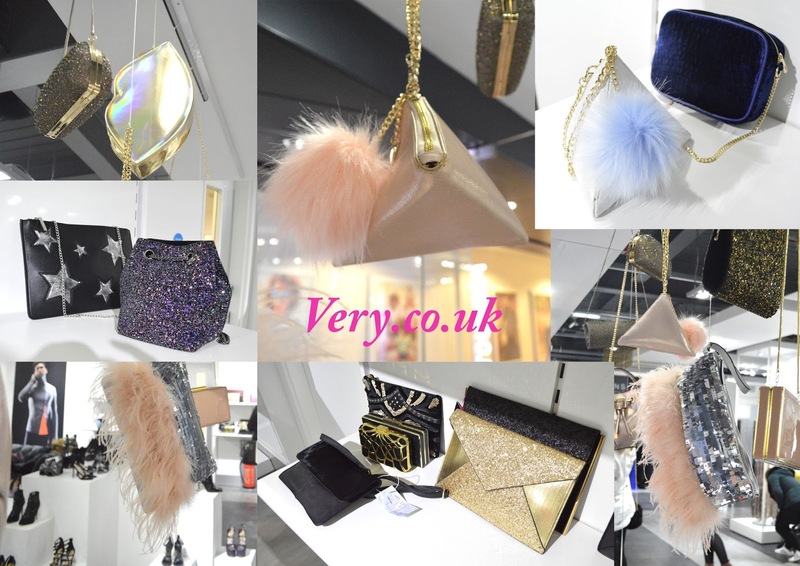 Last but not least a bag or purse to pop our NYX makeup in, my favourite bags was hung up in the window display with pom poms, feathers and sequins, Very have really done well with the collection of bags. I will certainly be buying that blue pom pom bag or the multi coloured glitter pouch or both. I'm going to be honest and say I haven't shopped on Very.co.uk often but after seeing the selection of brands and how well designed Very's own brand is, I will most definitely be checking the Very website when I need a glam outfit or even a festival outfit next summer. Thank you to Alex for inviting me along to this event, I hope there will be future events, it was a pleasure meeting you and seeing what Very has to offer this festive season. Thanks so much lovely. I'm happy with my photography here too. Everything was stunning your right, Very did a great job and have so much pretty items on sale now too. Thanks so much for reading lovely.